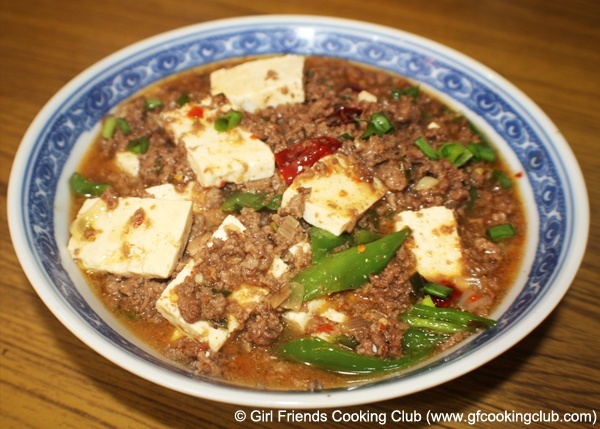 In a bowl, add the mince meat and chopped green onions, sauce sauce, ginger, red wine and aginomoto and mix well. Let it marinate for 10-15 mins. Meanwhile, gently squeeze the Tofu to take out as much water as possible and dry the tofu using paper kitchen towels. Dice the tofu in desired size of cubes. Heat 2 tbsp of oil in pan and add the minced meat and salt and cook it for 15 mins to the mince is nicely browned. Remove the mince from the pan into a separate dish. In the same pan, add 1 tbsp of oil and add the chopped onions, minced garlic, half of the chopped green onions, chopped dry red chillies, soya sauce, szechaun pepper and chilli sauce and stir fry for 2 mins. Add the chopped Green Chillies or Capsicum and fry for another 1 min. Add the cooked mince to the pan and mix it well . Fry for 3-4 mins and add 1 cup (150 ml) of water and cook for couple of mins. Now add the tofu pieces and gently stir it so that the pieces do not break. Let it cook for another 2-3 mins. Mix cornflour in half a cup of water and add it to the pan to thicken the gravy. 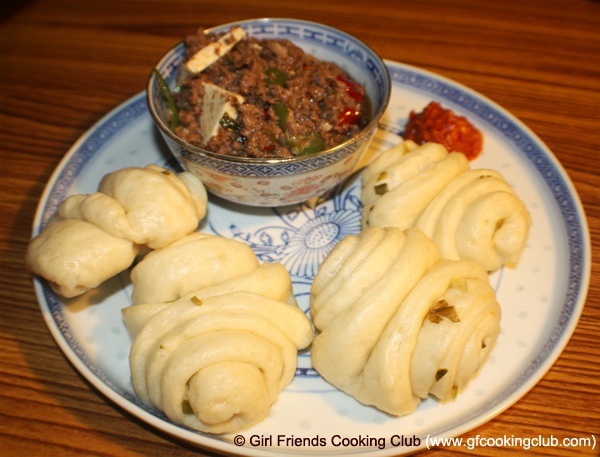 Cook for a minute and serve hot with rice or steamed Chinese flower buns , garnished with chopped green onions. This entry was posted in Chicken, Grand Ma's Recipes, Mutton, Pork, Tofu and tagged Mince Meat with Tofu by Kamakshi. Bookmark the permalink. I am cooking it tomorrow yeaahh!